The 20 climate scientists and academics who sent a letter to President Barack Obama asking him to prosecute global warming skeptics may be in big trouble. A congressional committee is now looking into the government-backed nonprofit that circulated the letter, demanding they turn over “all e-mail, electronic documents, and data created since January 1, 2009.” The group has one week to respond in writing to the committee’s request. The Institute of Global Environment and Society (IGES) “appears to be almost fully funded by taxpayer money while simultaneously participating in partisan political activity by requesting a RICO investigation of companies and organizations that disagree with the Obama administration on climate change,” Texas Republican Rep. Lamar Smith, chairman of the House science committee, wrote in a letter to IGES. 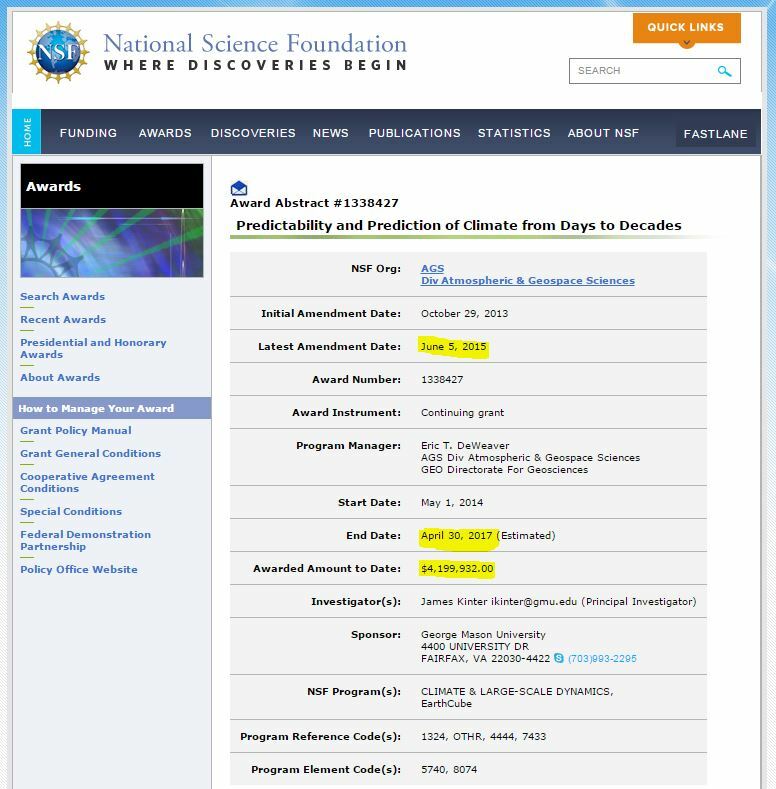 It seems like IGES’s effort to get Obama to prosecute global warming skeptics has completely backfired in the two weeks since their letter to the administration was published online. IGES has since taken down the letter and put up a message claiming the letter was “inadvertently posted” online. IGES’ claim it had “inadvertently posted” the letter urging the president to prosecute those who don’t agree with them on global warming comes after investigations revealed the group was getting millions from taxpayers, and that its founder was getting paid huge salaries for part-time work. Soon after the letter was reported on by news outlets, independent investigations revealed that IGES had gotten $3.8 million in government grants in 2014 — virtually all of the group’s funding came from NOAA, NASA and the National Science Foundation. But that was only the tip of the funding iceberg. “In fact, IGES has reportedly received $63 million from taxpayers since 2001, comprising over 98 percent of its total revenue during that time,” Smith noted in his letter, citing figures dug up by The Washington Free Beacon’s Lachlan Markay. It didn’t stop there. It turns out IGES’s founder and president Jagadish Shukla was making more than $333,000 in annual compensation for part-time work. This is on top of his $314,000 salary from George Mason University, according to Climate Audit’s Steve McIntyre. IGES joined GMU’s College of Science in 2013. And that’s still not all. Members of Shulka’s family were also employed by IGES. His wife, Anne Shukla, made $166,000 per year working at IGES, and the group also employed their daughter Sonia Shukla. GMU’s College of Science did not respond to The Daily Caller Caller News Foundation’s request for comment, and Shukla has ignored TheDCNF’s attempts to contact him in past stories. As for IGES’s claim it’s in the process of being “decommissioned,” the science blog Watts Up With That found evidence to cast doubt on that claim. They found an active National Science Foundation grant for nearly $4.2 million that was updated in June 2015 — one month before IGES had allegedly completed all its projects. Update: The National Science Foundation responded to TheDCNF’s request for comment over IGES’s letter to Obama. An NSF spokeswoman said the organization ha no comment on the letter and claimed there were no currently active grants with IGES.